Quantum Stones take pride in offering unique amulet and pendant designs that you won’t find anywhere else – because WE designed them…You won’t find our exclusive LightShield™ quantum infusion process anywhere else…and you will be pressed to find pendants that come infused with 3 powerful scalar frequencies. Our pendants are scientifically proven to raise the wearer’s vibrations, and auric testing has shown that they can aid in realigning one’s chakras to a harmonious, more balanced state. In a balanced state, one can raise their state of consciousness and achieve higher states of enlightenment and overall sense of well being. Our goal and vision includes helping others through the creation of informative articles, affirmations, and guided meditations to complement the effects of each of these LifeShield infused quantum stone pendants. We would like to share our resources and information further through lectures, group webinars, responsible social media campaigns, and steady blog posts. To put it simply, we are driven to help others understand their true essence as embodied spirits and our essential nature as beings of energy. What truly makes Quantum Stones new pendants stand out, is that you can opt to have up to 3 additional harmonics infused into your healing jewelry! Quantum infused healing jewelry amplifies the wearer’s energetic output and helps balance their auric fields upon touch…so what are you waiting for? 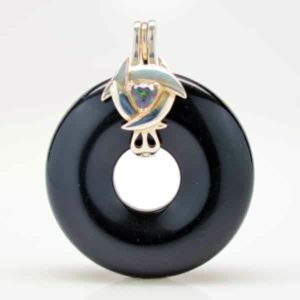 Find a Genesis Pendantt best suited to aid your spiritual journey below. 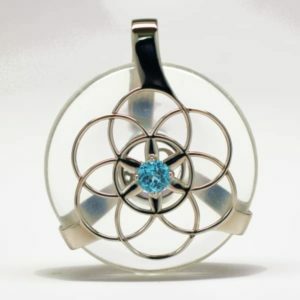 Upon independent lab testing our Seed of Life Amulets’ vibrational frequency, the report stated that this pendant in particular “Seems to have a life of it’s own!” exhibiting the amazing power of sacred geometry and quantum infusion combined! The Seed of Life is the basis of creation – the very foundation of life – formed by seven circles with sixfold symmetry. This multi-cellular shape manifests as 6 interconnected, ‘seeds’ surrounded by 1 – symbolizing the oneness of all things in the universe. Each circle perfectly fits into the larger one to form a dynamic field of potential geometric relationships upon which the infinite nature of life can be understood. The Seed of Life is one of the most fundamental shapes of nature, and can be observed in all things, helping one understand the fractal nature of life. Many view the Seed of Life as a depiction of the 7 Days of Creation, while others construe each circle as a mirror of a correlating chakra, musical scale, or the colors of the rainbow. In fact, this sacred geometry has been observed in both religious and spiritual circles throughout the world. These seeds flourish into the Flower of Life…one of the oldest sacred symbols known to man.